Marchez et Mangez Malin ! Geneva, July 10 — The first session of the historic United Nations negotiations towards a treaty on Transnational Corporations (TNCs) and other business enterprises with regards to human rights concluded today, following five days of inspiring talks on the need for a legally binding instrument. Civil society, expert panelists and many States engaged constructively in the negotiations, despite intense EU efforts to derail the process. During the opening session of the Intergovernmental Working Group (IGWG) the EU objected to the agenda for the meeting, suggesting last minute changes, and demanded an extension of the IGWG mandate agreed in UN Human Rights Resolution 26/9. The last minute demands, clearly lacking in good faith and contrary to democratic procedure, caused an impasse that was finally overcome when it became clear there was no consensus around the EU proposal. Given the European Union’s recent position towards Greece in support of the rights of financial institutions along with its decision to protect the rights of Transnational Corporations through the ISDS provisions in the TTIP, it is clearly prioritizing business interests over human rights. “The EU is working more as an ambassador of big corporations than a defender of international human rights law. A clear example of this disturbing position is the proposed Transatlantic Trade and Investment Partnership between the U.S. and Europe that could contain an investment protection mechanism giving economic interests primacy over human rights,” said Lola Sánchez, Podemos MEP. “But today we are full of hope because democracy can not be stopped. The referendum in Greece has shown that people are rejecting more austerity and are turning their backs on more neoliberal politics”. “States should now continue meaningful intercessional consultation, particularly with people affected by TNC abuses, to ensure real progress in the next round of negotiations,” said Brid Brennan of the Transnational Institute and the Global Campaign to Dismantle Corporate Power and Stop Impunity. “As civil society organizations and social movements, present here at the UN, we protest the disruptive behavior of the EU, and we challenge its member states to declare their position on this matter. The wellbeing of millions of people globally who have endured systematic corporate violations of their human rights depend on the IGWG to be able to continue and to fulfill its mandate, despite EU actions,” she added. 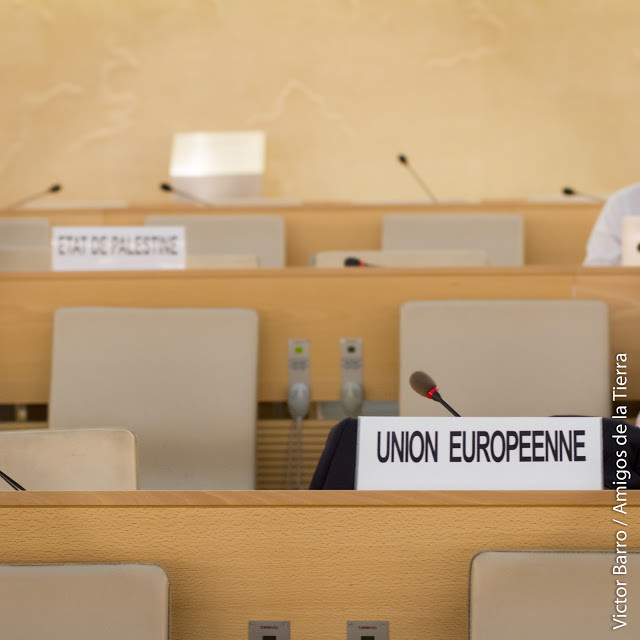 The first session of the IGWG on transnational corporations and other business enterprises with respect to human rights convened in Geneva on July 6th to begin the task of elaborating a treaty for business and human rights. GIFA est le bureau de liaison international du Réseau International des Groupes d’Action pour l’Alimentation Infantile (IBFAN), qui compte plus de 270 groupes, présents dans quelques 168 pays à travers le monde. Abonnez-vous à notre newsletter qui est envoyé 2-3 fois par an. Tenez-vous au courant des dernières nouvelles du monde de l’allaitement infantile. Copyright © 2014-2019 GIFA. All Rights reserved.